Super Hero Boy: Barney is turning 20! Not to ruin Barney's birthday, Happy Birthday purple friend. To celebrate Barney has released his own Best of Barney DVD which includes twenty of the favorite Barney episodes of all time. I watched a few of them while Connor was away last weekend and seriously Connor will have a mental meltdown from 20 back to back episodes of Barney overload. He is a huge fan, and when I say huge I mean he will take off running full blast from his room to the living room the moment it comes on so he can do the happy dance right in the middle of the living room. My favorite part about the set though is the extra features. There is a feature that shows the "I love you" song sung around the world. It was a neat twist to see the song that many of us parents know by heart sung in different ways. There is also a bonus episode of Fifi and the Flowertots which is pretty neato as I just rarely ever see anything come through here with Fifi episodes. Everyone's favorite purple dinosaur, Barney™, along with Baby Bop™, BJ™, Riff™ and all his endearing playground friends, is celebrating with an all new bonus-filled DVD, The Best of Barney, dancing into stores on September 9 from Lionsgate and HIT Entertainment. The special release, available exclusively on DVD, features the best Barney moments of all time and more than 20 songs, including performances by a young Demi Lovato (now starring in Disney Channel's "Camp Rock") and Selena Gomez (from Disney Channel's "Wizards of Waverly Place") from their days as cast members on Barney & Friends™. Barney's 20th Anniversary Celebration continues with "Best of Barney" month on PBS KIDS® in October, which will air the Top 20 favorite Barney & Friends episodes of all time. Also in fall, Play Along introduces the all-new "Sing and Celebrate Barney" musical toy. With sparkles from head to toe, Barney's belly lights up with special stars, hearts and musical notes as he plays three classic Barney songs! Oo that Barney toy sounds pretty cool! 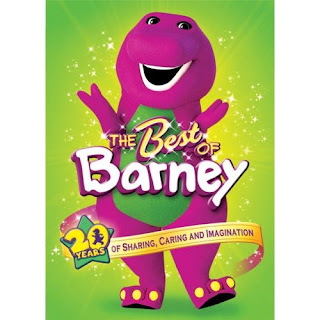 Best of Barney is available on DVD from Amazon! Leave a comment on this post. Check out the Best of Barney and tell me what is your first memory or favorite episode of Barney! Actually my first memory of seeing Barney for the first time was complete shock. Little children actually like this purple funny talking thing? That was BC (before child) and now my son loves Barney. I remember watching this with my younger brother. I had no clue it was old enough that I *could* have been watching him when I was little. I wonder if PBS was airing Barney when it first came out? yeah I checked with Wikipedia, he didn't make it to TV until 92 which explains why I wasn't watching him when I was 3. Honestly, my first memory of Barney was being annoyed by the "I love you" song when my little cousin was watching it! Now my daughter loves it. I am glad he's 20! I told my husband that I was watching barney with our daughter and remembered the songs & kids on the show. he was like "how old were you when you watched it? 14 LOL!!" So I will be sure to tell him! I would love to win this - you should hear my little girl sing along with the "I love you" song. And give me a kiss too! Melts my heart! And I am a subscriber!! My favorite memory of Barney is when he sings the song "everybody needs a nap". I NEVER pass up the opportunity to remind my daughter how true that is. Even Barney says so! I didn't grow up in America, so I never watched Barney. I want to win it for my son though, I bet he'd like it. I worked in a shoe store 100 years ago when I was single, and they played Barney all day in the kids' area. At the time, I thought he was annoying. Now that I have three kids under the age of three, I appreciate that he provides innocent, happy videos that are not offensive to anyone. My first memory of Barney was when I was flipping channels and saw him on PBS and I remember how annoying I thought he was and vowing if and when I had children, that they would never watch him. Now my daughter loves watching Barney and how can I deny her, he is very educational now that I actually sit down to watch him. She would love this DVD, thanks so much for the opportunity! Who can forget Barney's music? My brother's 16 and I remember watching him learn so many Barney songs. my nephew used to always want to watch a video of one of Barney's concerts...and I just remember it being soooo long! I distinctly remember the cleanup song. How crazy his voice sounded. I think the episode where they go to the North Pole is really cute. My first memory of Barney was finding it on PBS when we got new cable when my oldest was about 8, shes now 23!!!! The kids loved it! My favorite memory of Barney is singing the song with my children. Plus I would get some quiet time while they watched the show. My youngest is a fan of Barney now. But I first remember him about 13 years ago when my teenage daughter was just a wee one. She was obsessed with Barney and we had 22 VHS tapes of Barney. We also had Barney, Baby Bop, and BJ costumes which she had to wear all the time. The Barney Theme song has always been a favorite. Now Tristan knows it too! My first memory was watching Barney with my son now I watch it with my grandson, and also seeing Barney at Disney World and taking pictures with him with my grandson and his parents and my husband on our vacation in July. that was a great memory to see my grandson's eyes light up. My daughter loves Barney goes to school. My first memory of Barney was watching my friend's daughter literally scream at the TV with JOY, not fear, because she LOVED him so much!! It was so cute to listen to her sing along with lyrics of "I love you, you love me..."
my grandaughter shayna loves barney the about sharing was agood one every time I take a bite of some food shayna says share grandma even though she has her own but she 2 . I still sing "Sally the Camel" and my oldest stopped watching Barney years ago! My youngest is soon to begin, all my old Barney in on VHS.....I need to get with the times ang get some Barney DVD's! I can't even believe I'm entering a giveaway for ANOTHER Barney DVD, but my kids would be in heaven!! :) My first memory of Barney was when I was about 12 and the kids I babysat were so in awe of this obnoxious purple dinosaur. He annoyed me now and still does a bit today...but the kids love him, so I deal with it. LOL!! My first memory is hearing when he sang I love you. My favorite memory of Barney is when he sings the song "everybody needs a nap". I love you! of course! My kids like the DVD that we have that is Barney and Friends in concert. His clean up song. Without me singing it, my kids wont clean up. But when I do they join in and clean up the mess. My niece who is now 16 loved Barney when she was little -- she had a Barney plus doll, and I in my foolishness said he was purple "He's not purple she said He's Magenta!" lol - that's my first Barney memory! I would love to have this for my niece who will be 2 this November. over and over and over!!!! There used to be a Barney VHS tape called "Barney Songs" that was the ONLY thing my daughter would watch. 11 years later and I still remember every darn song on that tape. My other 2 liked barney but not as much. Probably because there is so much more out there to watch now. I still buy Barney DVDs as gifts for friends and family. When my oldest daughter was a toddler she loved music (<-still does!) we played dress up, sang, etc... We were given some Barney VHS tapes and our love began! I do have to confess, we stopped watching new ones that had Baby Bop though - baby talk just was not something I wanted to encourage! lol We still have the VHS tapes and play them whenever Alexxa comes over! My daughter is 18 (almost 19) and when she was young Barney was her whole world. Her birthday's were Barney themed, She has a Stuffed barney in every size, including one that was way bigger than her. She watched the movies over and over, she sang the songs over and over lol. If there was a barney item she didn't have back then, I would be very surprised. Who would have thought a purple dinosaur would become that popular and last this long???? I just had my first and I was too old to be into Barney, so I don't have any Barney memories. I would like to make some though. My memory is of him singing "I love you." This is hard. My kids were too old for Barney (they were 19 and 17). But all of a sudden I was aware of this big purple dinosaur - and he's still going strong! GO BARNEY! i like the i love you song. I haven't seen the song in a long time and now I am on my 2nd Barney watching baby but I loved "Sally the Camel" and sing it to my son using his name and he loves the "boom, boom, boom, boom" part. great video - I would tuck it away for my newest grandbaby!! My Oldest daughter loves Barney so much that he was her imaginary friend! Now my son loves him, too. I still sing the I love you song.. I think Barney makes dinosaurs fun instead of portraying them as big scary monsters that eat people! I never watched Barney but my daughter likes to jump around and dance when they sing. I love the night before Christmas one. My kids love that one. My oldest son, who is 15 now, just adored Baby Bop. He had a stuffed Baby Bop that went everywhere with us for years. I can't tell you the times that Baby Bop got left behind or dropped, and I had to go back and find her. And now for the real embarrassing part (don't tell his girlfriend), that same very loved Baby Bop is now in his closet and he refuses to get rid of it. (tooo cute).